Metal detectors use electromagnetic fields to detect the presence of metallic objects. They exist in a variety of walk-through, hand-held, and vehicle-mounted models and are used to search personnel for hidden metallic objects at entrances to airports, public schools, courthouses, and other guarded spaces; to hunt for landmines, archaeological artifacts, and miscellaneous valuables; and for the detection of hidden or unwanted metallic objects in industry and construction. Metal detectors detect metallic objects, but do not image them. An x-ray baggage scanner, for example, is not classed as a metal detector because it images metallic objects rather than merely detecting their presence. 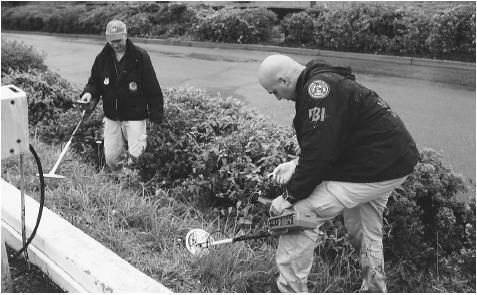 FBI agents use metal detectors to search for evidence in a series of sniper attacks that occurred in the Washington, D.C., area in 2002. Hand-carried metal detectors. Metal detectors small enough to be hand-held are often used at security checkpoints to localize metal objects whose presence has been detected by a walk-through system. Some units are designed to be carried by a pedestrian scanning for metal objects in the ground (e.g., nails, loose change, landmines). All such devices operate on variations of the same physical principle as the walk-through metal detector, that is, they emit time-varying electromagnetic fields and listen for waves coming back from conducting objects. Some ground-search models further analyze the returned fields to distinguish various common metals from each other. Hand-carried metal detectors have long been used to search for landmines; however, modern land mines are often made largely of plastic to avoid this cheap and obvious counter-measure. New technologies, especially neutron activation analysis and ground-penetrating radar, are being developed to search for nonmetallic landmines. Gradiometer metal detectors. Gradiometer metal detectors are passive systems that exploit the effect of moving ferromagnetic objects on the earth's magnetic field. A gradiometer is an instrument that measures a gradient—the difference in magnitude between two points—in a magnetic field. When a ferromagnetic object moves through a gradiometer metal detector's detection space, it causes a temporary disturbance in the earth's magnetic field, and this disturbance (if large enough) is detected. Gradiometer metal detectors are usually walk-through devices, but can also be mounted on a vehicle such as a police car, with the intent of detecting ferromagnetic weapons (e.g., guns) borne by persons approaching the vehicle. Gradiometer metal detectors are limited to the detection of ferromagnetic objects and so are not suitable for security situations where a would-be evader of the system is likely to have access to nonferromagnetic weapons. Magnetic imaging portals. The magnetic imaging portal is a relatively new technology. Like traditional walk-through metal detectors, it illuminates its detection space with radio-frequency electromagnetic waves; however, it does so using a number of small antennas arranged ringlike around its portal, pointing inward. Each of these antennas transmits in turn to the antennas on the far side of the array; each antenna acts as a receiver whenever it is not transmitting. A complete scan of the detection space can take place in the time it takes a person to walk through the portal. Using computational techniques adapted from computed axial tomography (CAT) scanning, a crude image of the person (or other object) inside the portal is calculated and displayed. The magnetic imaging portal may for some purposes be classed as a metal detector rather than as an imaging system because it does not produce a detailed image of the metal object detected, but only reveals its location and approximate size. "Guide to the Technologies of Concealed Weapon and Contraband Imaging and Detection (NIJ Guide 602–00)." Institute of Justice, US Department of Justice. February 2001. < http://www.ojp.usdoj.gov/nij/pubs-sum/184432.htm > (April 23, 2003).